If you’ve read my fantasy romance novella Abiku: A Battle Of Gods, that I wrote under the name Elizabeth Salawu, you should be able to guess that Sango is one of my favourite Orisas. Sango represents what a true man is to me (apart from his polygamous nature). He’s strong, powerful and protective and his followers know that he’s always got their back. 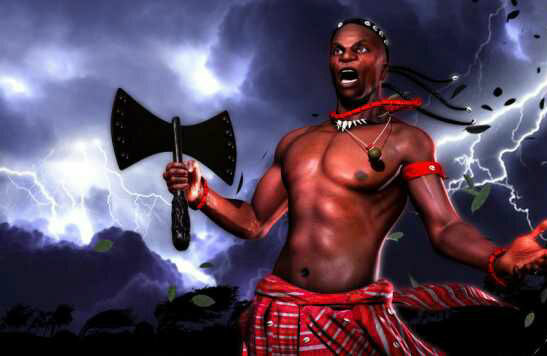 Sango is the Yoruba god (Orisa) of thunder and fire. Oriki is the Yoruba word for praise poetry. Yoruba’s pay homage to everything and everyone, including food. In my book Yetunde: An Ode To My Mother, I wrote the praise poetry for a mother (Oriki Iya). Most (if not all) Yoruba families have their own orikis. One thing I especially love about Sango is that he took his 3rd wife Oya with him into battle. To me it shows that even with his strength, he acknowledges the strength of the woman in his life. A prosperous man, in my opinion, is one who can work with his partner and not try to dominate her. There seems to be different versions on Sango’s Oriki and seeing as I’m not a devout follower, I couldn’t tell why I came across several versions. HE SAYS; IF YOU GREET LADOBO THERE WILL BE TROUBLE. IT IS NOT UNTIL SOME PEOPLE ARE INVOLVED IN TROUBLE THAT THEY WILL ACKNOWLEDGE SANGO AS THEIR ONLY SAVIOR. If you can forgive the quality of the video (there aren’t that may Yoruba heritage videos online) here’s a video about Sango. Happy viewing! Disclaimer: I can admire Sango without being his worshipper, so no, I am not a Sango worshipper! This entry was posted in Segilola's Corner and tagged god of thunder, oriki, oriki sango, praise poetry, sango, sango's oriki, Yoruba praise poetry. Bookmark the permalink.